In 1926, professional musicians Constantine Shapiro, born in Moscow, 1896 and Lydia Chernetsky (Odessa, 1905) met and married in Berlin, Germany after their respective families had suffered continuous persecution in war-torn Russia, or the Soviet Union, as it was known after 1922. With Hitler’s national socialism on the rise, remaining in Berlin was for the newly-weds out of the question and they decided to continue their odyssey, first to Palestine, then China, to ultimately spend the World War II years in the relative safety of Japan. In 1931, they found themselves in Japan, where Isaac, son number four and author of this memoir, was born. A few years later, with World War II imminently looming, and the subsequent bombing of Pearl Harbor, their lives were disrupted once again. In 1944, the Yokohama shore was banned for foreigners and the Shapiro family including their five children, were forced to move to Tokyo, where they survived endless hardships, among others the intensified strategic United States bombing campaigns on Tokyo. Operation Meetinghouse started March 9, 1945 and is regarded as the single most destructive bombing raid in human history. The Japanese later called the operation the Night of the Black Snow. 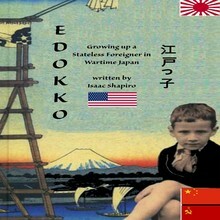 During the subsequent American occupation of Japan, 14-year-old Isaac, being multi lingual, was hired as an interpreter by John Calvin ‘Toby’ Munn, a United States Marine colonel, (later promoted to Lt. Gen.) who, when the war was over, paved the way for Isaac, or Ike as he soon became known, to immigrate to the United States. In the summer of 1946, Isaac landed in Hawaii, at the time a United States territory, altering the course of his life forever.